The R-PLEX Human Clusterin Antibody Set includes a matched capture and detection antibody pair and calibrator for the quick and easy measurement of Clusterin in biological samples. R-PLEX products leverage MSD’s electrochemiluminescence technology for better sensitivity and a larger dynamic range than traditional ELISAs. R-PLEX matched antibody sets enable the development of singleplex and multiplex immunoassays. Individual assays may be developed using MSD avidin- or streptavidin-coated plates. Custom multiplex assays with any combination of R-PLEX analytes, as well as R-PLEX plus U-PLEX analytes can be developed on U-PLEX MULTI-SPOT plates. To learn more about the advantages of R-PLEX products click here. 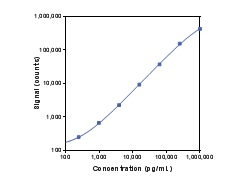 Calibration curve for the R-PLEX Human Clusterin Antibody Set was assessed and representative data is presented below. Description - Clusterin (CLI, AAG4, APOJ, CLU1, CLU2, KUB1, SGP2, APO-J, SGP-2, SP-40, TRPM2, TRPM-2, NA1/NA2, CLU) is a glycoprotein that is found in most mammalian tissues. The localized over-expression of clusterin at sites of tissue damage or stress indicates that clusterin acts as a molecular chaperone displaying cytoprotective characteristics. Increased expression has been consistently detected in damaged tissues from brain, liver, breast, and kidney. In the kidney, marked induction of clusterin occurs following renal tubule injury. Clusterin levels in urine can be used to distinguish between glomerular and tubular injuries; they can also be used to assess the severity and progression of renal damage. Time course of renal proximal tubule injury, reversal, and related biomarker changes in rats following cisplatin administration.